The main component of SSRES 2019 will be intensive courses in Russian or Kazakh, offering the equivalent of a full academic year (8-weeks) of in-class instruction in all aspects of the language. Language courses at SSRES are taught using the communicative method of instruction through linguistic and cultural immersion. Students are placed into appropriate groups, according to their levels of proficiency (as defined in ACTFL Proficiency Guidelines). Courses are taught by professionals, trained in current methodologies and experienced in teaching international students. In addition to attending regular office hours held by instructors, students will be able to practice their conversational Russian and Kazakh skills and get additional support from bilingual student tutors. Designed to be broad in focus and accessible to general audiences, lectures on topics related to the culture, history, politics and literature of Kazakhstan are given by the Nazarbayev University professors who introduce students to the most current research in their fields. The Lecture Series is open to the SSRES 2019 participants, as well as to the NU community, including students and faculty. The list of the lectures for 2019 will be announced in advance. Our program is unique in that it fosters close contact with local NU students. 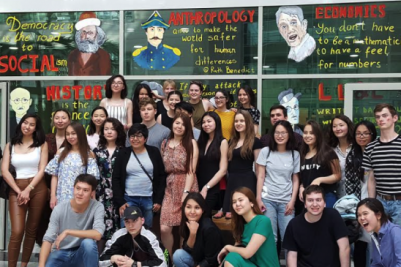 The tutoring program, housing arrangements, and cultural programming all enable SSRES students to feel at home in Astana and forge lasting international friendships, from the time when they are met at the airport their departure at the end of the program. International students live on campus where they share dormitory rooms with NU students, who speak both Russian and Kazakh. A typical room has two beds, two study desks, closets, and a bathroom. Students living in the dormitory also have access to fully-equipped kitchens. Our modern and well-maintained campus contains everything students need, including a pharmacy, laundry facilities, cafeteria, hair salon, study rooms, cafes, restaurants, and more. The buildings are fully guarded and secured with 24/7 resident assistance. For information on program fees, please see our website: http://shss.nu.edu.kz/shss/academics/ssres. SSRES 2019 is open to graduate and undergraduate students as well as to working professionals. Students must be eligible to obtain a visa to live and study in Kazakhstan. Nazarbayev University will provide visa information and support (included in the cost of the program). We accept FLAS and most other scholarships.